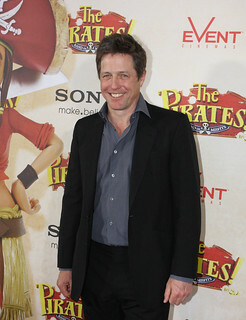 British movie star Hugh Grant arrived in Sydney yesterday, without too much attention, one day ahead of time for his involvement in the Australian premiere of The Pirates! Band of Misfits. The 51-year-old actor, who recently became a dad, is in Sydney to promote his new animated movie The Pirates! Band Of Misfits, which this afternoon enjoyed its red carpet premiere at Event Cinemas at George St.
"I feel great," Mr Grant told Rupert Murdoch's News Limited. "I've got old friends I'm going to catch up with while I'm here." Perhaps he's best known for his lead in The Four Weddings And A Funeral movie, but he's keen to become better known for more serious and dark roles. Mr Grant became a dad to a baby Tabitha, last October, after a "fleeting affair" with Chinese actress Tinglan Hong. He recently said of fatherhood: "I like my daughter very much. Has she changed my life? I'm not sure. Not yet. Not massively, no. But I'm absolutely thrilled to have had her - I really am. "And I feel a better person." Grant is also the godfather to ex Liz Hurley's nine-year-old son Damian, who he took to the London premiere of The Pirates! on March 21. Band of Misfits is the Brit's his first shot at a role in an animated feature. The movie, which was created by the makers of Wallace and Gromit and Chicken Run, stars Grant as the enthusiastic, although not very successful, Pirate Captain. Grant said preparing for the role should have been more soothing but he still managed to get himself into a panic before the recording sessions. "(I) did a lot of rehearsal in my kitchen," he told media on the red carpet. "I always find I was very good in my kitchen. "I think it was partly because ... the room had a lot of echo which is very good for a pirate's deep voice. "(But) then I get into the recording studio, which has a very dead silence (and) I thought, 'Oh, it's not working'."